After a quick internet search for the artist, I learned that Spak is a DMV local. A long-time Potomac, MD resident, she lives and works in my relative backyard. To my delight, I could see her work in person at the recently opened Martha Spak Gallery in one of DC’s most fashionable neighborhoods, the newly developed District Wharf. It turns out that Spak is a self-taught artist. She has a degree in Journalism from the University of South Carolina and an Executive Certificate for Intellectual Property Negotiation from Harvard. After the birth of her second child, however, she decided to retire from her corporate job which had required her to travel. It was during this time of her life, while enjoying lengthy new baby naps, that Spak picked up a paintbrush and began experimenting. What started as a peaceful reprieve during her time raising young children, ultimately led to a successful second career in the art industry. As a professional painter, Spak connected with other local creatives at regional arts centers, such as the Torpedo Factory in Alexandria, Virginia and the Rehoboth Art League in Rehoboth Beach, Delaware. She realized the importance of submitting her work to numerous juried competitions. She also decided that her home studio space in Potomac could double as a gallery for meeting with potential clients and interior designers. At the same time, Spak cultivated relationships with several galleries outside the beltway. Her work can be found at Vanderbilt Gallery in Nantucket, Massachusetts, Peninsula Gallery in Lewes, Delaware, and MAE Gallery in Delray Beach, Florida. There have been two major turning points in Spak’s career as an artist. The first came seven years ago when a distributor reached out after searching for saltmarsh waterways on the internet and happened upon her name. 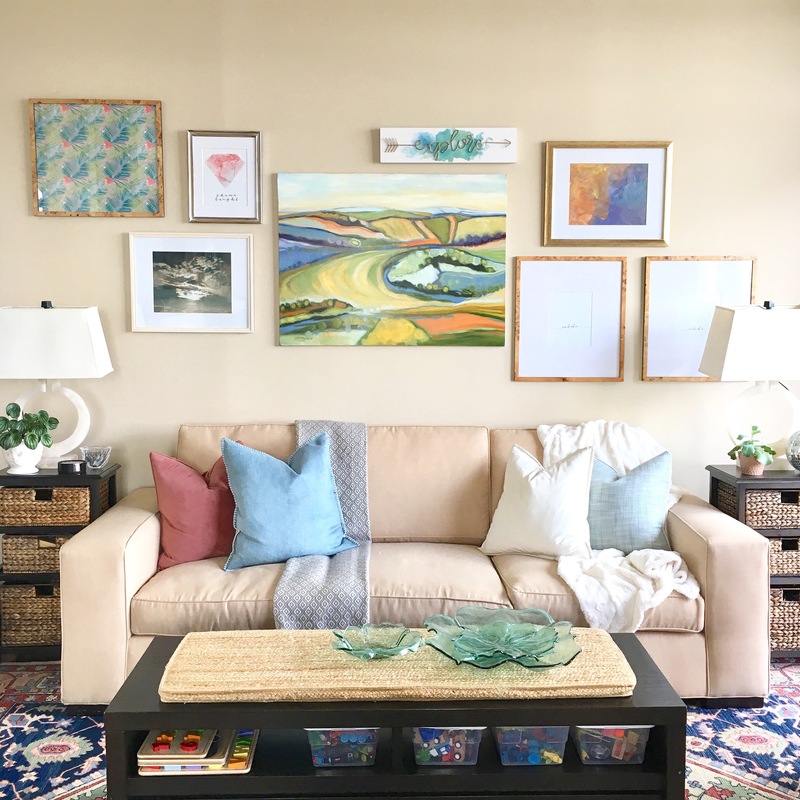 This chance connection and ensuing business relationship led to Spak’s work being sold through Ballard Designs, Pottery Barn, Frontgate, and William Sonoma Home. The second major turning point came just last summer at the Rehoboth Beach Outdoor Fine Art and Fine Craft Show. While participating in this annual juried competition, a representative from the developers of DC’s District Wharf approached Spak about opening a gallery space in their new location. That was August of 2017. The following month, Spak saw the space for the first time and incredibly, by October, she had opened the doors to her new gallery. Spak advises artists to carefully consider their overall professional presence. What does this mean? Creating a consistent body of work and being able to present and discuss it in a thoughtful manner. Approach painting as you would any other job by setting goals for yourself, establishing a reliable but realistic work routine, and continually challenging yourself to grow. This self-development is fortified by participating in artists’ workshops, embracing teaching opportunities, and submitting work to juried competitions for peer review. Spak wants visitors to District Wharf to remember that an art gallery is meant to be enjoyed. Don’t be afraid to wander in and look around. Ask the person sitting behind the desk questions about the work. Even if you are not ready to purchase a piece today, visiting a gallery is a great way to get a feel for a painting style up close. By seeing the artwork in person, you can start to learn your personal preferences in terms of subject matter and medium. Most importantly, you can learn what speaks to you personally and engages you as a viewer. You can catch Spak at the 45th Annual Outdoor Fine Art and Fine Craft Show in Rehoboth Beach, Delaware August 4-5th and 11-12th. This will be her tenth year participating in this juried competition, which features the work of over 100 artists. This upcoming winter, Spak will also be exhibiting her work at the Sandy Spring Museum in Sandy, Spring Maryland. Running from February 7th through April 16th, the show will feature paintings and sculpture by Spak, as well as the fine art photography of one other local artist. More details to be released as the opening date approaches.